The Avalon and SANE financials for the fiscal year have been overwhelmingly positive as the organization continues to grow and develop. Income recognized in the current year was approximately $1.1 million (2017: $672,000) which included several sources of both new and ongoing funding. Most notable increases were 431,761 from the Province of Nova Scotia: Nova Scotia Health Authority, a second year of funding from the Province of Nova Scotia: Community Support Network Grant and $98,624.00 from donations and fundraising efforts from private and corporate donors. While some of the new funding sources were short term or project funding, we also received the confirmation of multi-year and year-to-year funding. All of these sources contribute to the ongoing sustainability of Avalon Centre. 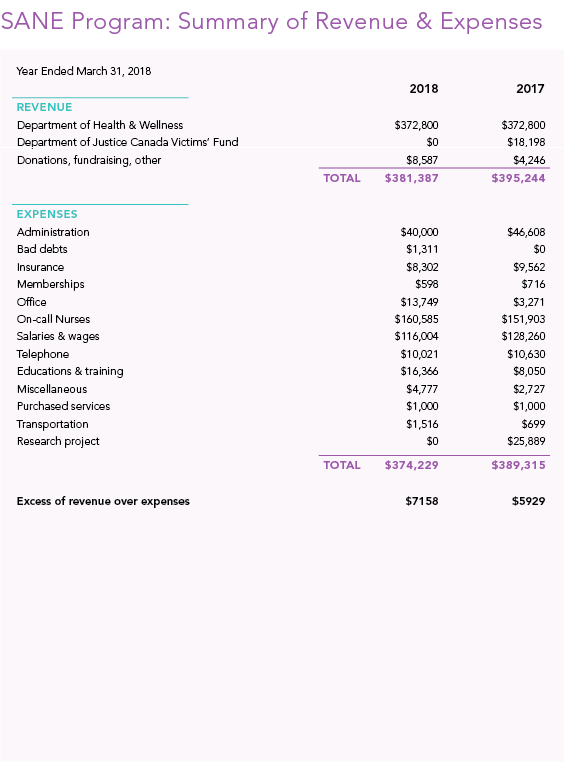 The SANE program has maintained steady funding ($372,800.00) and continues to operate consistently (Net Income 2018 – $7,158 (2017: $5,900). Over the past few years, total numbers of requests to the SANE Program have increased to the point that we need to monitor the ability of the current funding to support a continued increase of responses to the hospital and other program priorities. Avalon’s expenses in the fiscal year totaled $995,046 (2017: $749,300) with major increases in line with strategic spending for livable wages, a better working space, and larger professional fees to handle the demands of a growing organization. The net income after expenses in the current year ($100k) is above our budgeted expectations. This is mostly due to our added effort in fundraising and individual donor income as well as multi-year project funding that will continue in 2018/19. A portion of this income is allocated to our reserve fund and will be used as a contingency fund in the upcoming year. The remainder will remain available for use by the organization and will be prioritized based on strategic need.